We had our wedding here in December and the staff couldn’t have been more helpful or friendly. The price for weddings is very competitive. The hotel itself looks very well, the rooms are much better than any other hotels locally. The food was lovely and served really quickly when we in for dinner. The staff were also really accommodating for any vegetarian guests. Overall the hotel provided a great venue for a really enjoyable day and night! Where do i begin?! Guys you really outdone yourselves for my recent wedding on December 1st, from working behind the scenes with Riccardo and Nathan, to on the day with Madeleine. MADELEINE!!! You are absolutely amazing at what you do, so much precision and excellence and everything was done with pride and a smile on your face, we thank you so much. All the staff were amazing too, and the food! I thought I wasn't going to eat much on my big day, but I couldn't refuse it! Unreal! All my guests had a wonderful day and have been singing your praises! You are all experts at what you do and no task is left undone! What a brilliant experience!! We held our wedding reception in the hotel on Saturday and had the experience of a lifetime! The food was amazing, the service was exceptional and I can honestly say we had the best day of our lives. The extra touches made all the difference and all our guests remarked on the fact that all the hotel staff took care to make sure everybody felt valued and special on our special day. I would like to take this opportunity to especially thank Nathan and Madeleine for the time they spent with us, right from the first stage of planning right up until we checked out this morning. Our room was like a palace and all our guests have commented on the standard of accommodation that was laid on for them. We would absolutely love to repeat our wedding and wouldn't change a thing. We were definitely in the hands of experts and can't thank everyone at the hotel enough. 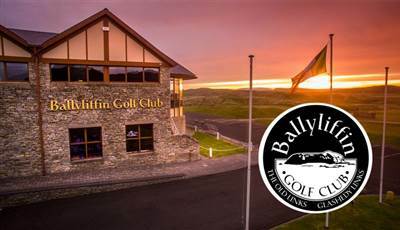 No doubt Ballyliffin Lodge will remain high on our priority list for a weekend break in the not too distant future. Thanks again guys, we have had a weekend we will never forget, and hopefully you enjoyed it as much as we did. "Alan & Denise's wedding 22nd September 2016"
Where do we start about this wonderful place. From the minute we booked our wedding at the Ballyliffin Lodge & Spa, we where taken back by the hospitality of the banqueting team of Nathan, Madeleine and staff. They couldn't do enough for us on the day. From the guests arriving to the last man standing, the efficiency and professionalism was second to none. We had a fantastic day and our guests had nothing but good reports to give. We would highly recommend this hotel for your wedding, or even a few nights away, great hotel, great location! "Best Hotel in the North West!" Had my wedding here in September and could not have been happier with it. Everything went perfect from start to finish, staff were so good and worked so well as a wedding team. Special thank you to Nathan for planning especially before the big day and for some help afterwards. Thank you to Riccardo for professionalism on the day, last but not least thanks big Michael for his work on the big day and when every time we visit this wonderful hotel. John and I would like to kindly thank all the staff at Ballyliffin Lodge and Spa Hotel and in particular Nathan and Riccardo for giving us the most amazing wedding day ever. We cannot thank you enough for making the day a true success by your professionalism and hospitality. Your attention to detail, kindness and support made not only the planning stages but the day itself a truly memorable. Nathan and Riccardo helped us to create the reception we wanted, and dreamed of having. Once we put the idea of what we wanted, Nathan and the staff helped fine tune our reception to perfection. The staff at Ballyliffin Lodge were always available for any questions or concerns we may have had throughout the months prior to our wedding. We received so many positive comments from our families and friends regarding the meal and exceptional service and is still a talking point amongst all our guests. Both your service and your staff exceeded our expectations. We truly enjoyed our time with the Ballyliffin Lodge and will always cherish the memories of our wedding and the entire experience of working with Ballyliffin Lodge. We were so lucky to have been able to celebrate our wedding here. Start to end, nothing was too much trouble for Nathan & Riccardo! Everything was done to a five star standard and if I could give it six I would! Food was amazing, attention to guests outstanding and they know how to put on a great party, 11/10 and thats not just from the Bride, its from all the guests too. We had our wedding in the Lodge in November 2015 and everything was just perfect - staff, food, service & accommodation. What more could you want. We recently attended a friend's wedding in the hotel and Madeleine (head of service) even came up to say hello to us at the table which was lovely. Food/Service was amazing that day also. That reminded us that we must put this review up! Thanks to Riccardo who was so easy to deal with in the lead up and to Madeleine & all the staff for the superb service on our wedding day. We had our wedding here two weeks ago and cannot sing their praises high enough. Nathan and Riccardo were fantastic in helping us arrange the wedding during the run up. On the day of the wedding we had Madeleine as Master of Ceremonies and she made the day run smoothly. She made sure to take us aside when we arrived back to check the room was set up ok ahead of guests entering and to double check music, timings etc. The food was outstanding, but we already knew this, having tried the Sunday carvery and Jack's Bar several times before. The standard of service was fantastic, and we constantly had friends and family tell us how nice all the staff were. The rooms are lovely (especially the honeymoon suite!) and everyone was talking of how large their rooms were. Excellent facilities in the rooms and cooked breakfast the next day. Thanks again to Nathan, Riccardo, Madeleine and the team. Look forward to going back soon. "Excellent Customer Service, Brilliant Stay and PERFECT Wedding!" We had the opportunity on the 21st of June to have our wedding at this establishment. Having only booked the hotel and spa months in advance, we had a lot of work to do to get it to where it was and without the help of everyone at the hotel and spa, we wouldn't have been able to do it. Everything about this hotel was fantastic. The food was luscious, the WHOLE team of staff at the bar, spa and hotel were beyond accommodating and brilliant and big shout out to Riccardo and Nathan who made our day fantastic! Had my wedding here on the 6th May 2016 and it was fantastic! The staff were brilliant and nothing was any trouble! Nathan and Madeleine were both excellent and made sure they day went smooth which it did! I really recommend this hotel for any type of function. On the day Madeleine made me feel so at ease and she is a total lady and fantastic at her job! Nathan too was excellent and was always at the other side of the phone / email if I needed anything. The Waiting staff were all fantastic and are a credit to the hotel as are all the staff! Thanks so much guys for making our wedding day so easy and fun! We had our wedding here on the 11th June. I would like to especially thank Nathan who helped us with everything on the run up to the wedding. On the day Madeleine was great, she was just there when you needed her. All of the staff where friendly and they couldn't have done more for us. Everything that I asked for was done. 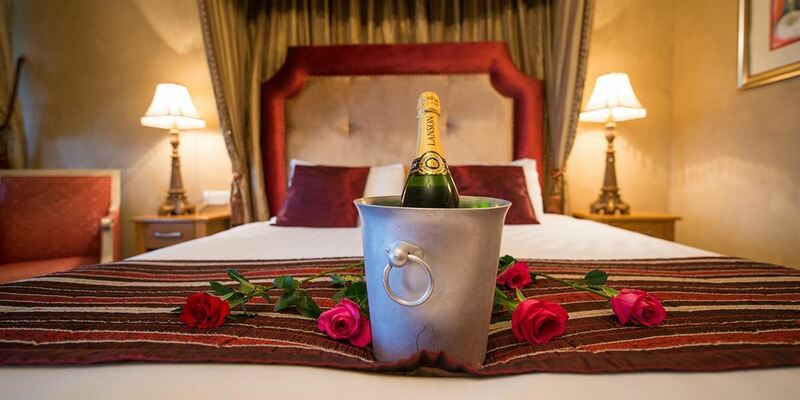 The guests just loved the food and the honeymoon suite was amazing. I would highly recommend this hotel to anyone. We would just like to thank you for making everything so perfect on our wedding day, from the initial booking to all the fine details. Everyone was so impressed with the food and the warm welcome from staff (Has to be the friendliest hotel around). You took a lot of stress out of planning the wedding and I can safely say your "You Dream It, We'll Do It!" motto is 100% true. Looking forward to coming back again for our anniversary. I felt I had to write a review on the Ballyliffin lodge and spa hotel after celebrating our wedding there on Saturday. The hotel and their staff were brilliant from start to finish. They were ever so helpful and even managed to get me another room for a key guest right at the very last minute.Must say special thanks to Lorraine, Nathan, Ricardo and Madeleine. The food and service on the night were 10/10. The rooms were excellent and jacks bar was excellent. We had the best day of our lives and would strongly recommend Ballyliffin lodge and spa for any upcoming weddings. We recently had our wedding in the Ballyliffin Lodge and I could not recommend it highly enough. Nathan was our wedding co-ordinator and was extremely helpful throughout the process, nothing was too much to ask. 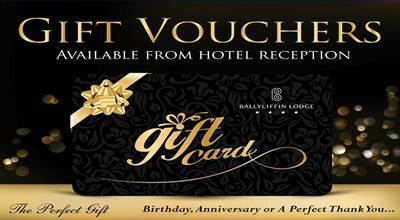 The staff were friendly, food was great, everything was perfect and I would have no hesitation recommending the Ballyliffin Lodge to anyone. We would like to say a very big thank you to you all for all your help in the run up to our wedding and on the big day. We were very happy with everything and how it all ran like clockwork. Nathan, Riccardo & Madeleine are fantastic and talented at their work and to Marie and Roisin for all your help with the rooms and all the changes that ye made. A big thank you to the kitchen staff and all who helped with the meal. A fantastic hotel, well run in every area. I would like to thank you sincerely for the incredible level of service we received at our recent wedding. We were blown away by how pleasant and helpful all the staff in every area of the hotel were. All of our guests commented on the outstanding level of service also. On the wedding day itself, we couldn't have asked for any better. Everything was top notch and we sincerely thank you for that. The food was beautiful and many of our guests said to us that it was the best"wedding food" they have ever had so please pass our compliments to the chef and his staff. It really was such an enjoyable weekend. We will certainly be visiting with you again in the near future, as I'm sure a lot of our guests will also. I had my wedding in the Ballyliffin Lodge Friday 5th February 2016, from the moment we booked in on the Thursday afternoon until the Sunday we were treated like royalty. The staff are a credit to the hotel,always approachable and friendly, couldn't do enough. Thanks to the staff for their kind treatment and support on my wedding day, and providing genuine concern when we had a medical emergency on the day. Thanks also to the girls who did my hair and make-up, very friendly and professional. 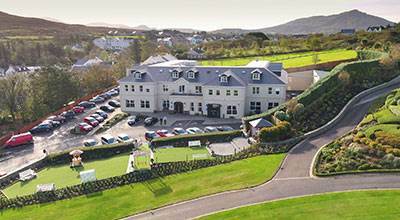 Would highly recommend the Ballyliffin Lodge, with its beautiful rooms and scenic views. Food was excellent, we were even offered seconds, the service was seamless. Made my husband and I feel so special, thanks again to all the staff, and a special thanks to Madeline who helped take the stress out of the day. After seeing the Ballyliffin Lodge on the internet. We travelled to their wedding fayre in Feb 2015 and we were certain we would book as soon as we walked into the foyer! My Wedding Day was a magical day thanks to professionalism of the wonderful staff. The 'can do' attitude of all of the hotel staff is outstanding. Truly talented beautician and hair stylist, spotless rooms, fabulous food,stunning spa. Special thanks to all who made my day flow with ease, especially Madeline! We held our wedding reception at the Ballyliffin Lodge last month and from the day we booked to the day we left the treatment we received from staff was next to none.. Roisin booked our wedding and helped us with every enquiry we had, she was there on the day of the wedding and went out of her way to help. Nathan the wedding coordinator was on top of everything, took time out of his busy schedule to sit down for a chat with us even when we didn't have an appt. Nathan ensured everything we wanted was included in our package and helped us to a very high standard. On the day of the wedding Ricardo & Madeline were amazing, they ensured everything went smoothly and everyone had an amazing day. Little things mean so much like Madeline taking the time to see to our 4 year old daughter who just wanted a bit of everything on the menu, she sat beside her and cut up her food and everything!! We really couldn't have asked for better, the food was amazing, the hotel was amazing and each and every member of staff we met before and on the day of the wedding were absolutely fantastic. They really go out of their way to make your day everything you could dream of. Thank you to the Ballyliffin Lodge for making our Wedding day a day we truly will never forget!! Had a fantastic day, everything was perfect. Excellent food and service. The staff were helpful and friendly, even helped guests staying in other hotels get back. Anything we wanted they did their best to accommodate.Perfect place for our wedding. We had our wedding here on 15th Jan 2016. The staff are absolutely amazing!! They make you feel so special and everyone knows you byname!! The silver service during dinner was outstanding and special recognition to Madeleine who made sure our day was perfect and everything ran smoothly! !The Food was outstanding and couldn't fault it in any way!! Nothing was too much for them, even during the preparation leading up to it Riccardo &Nathan were very attentive to our needs....We stayed the weekend so I used the salon facilities to get hair and make up done on the wedding day ..Louise & Roisin were incredible and even came back up to the room to do a wee touch up before the ceremony and we were invited to call in during the day if we needed another touch up!! I would highly recommend this hotel for weddings!! Thanks so much for making our day perfect! !